I’m not sure why anyone would be interested in a Florida bar band that most people outside of Florida have never heard of — a group that rose in the early ’80s and then sputtered to a stop well before the end of the decade, leaving behind no real hits and no MTV videos to get nostalgic over. Why would anyone care about a beer-drenched band led by a singer who called it quits, left showbiz for law school, and never looked back? Because they sound so dang good! You have to wonder why you never heard of them, and you wish you had been there for at least a few of those nights in some sweaty Fort Lauderdale saloon. This is the story of Charlie Pickett, attorney at law, whose studio work from the crazy ’80s was recently released in an irresistible retrospective from Bloodshot Records. 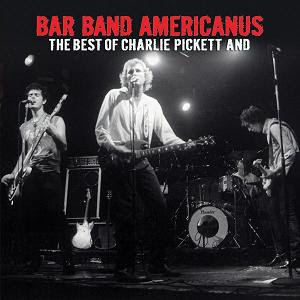 The album Bar Band Americanus is credited to Charlie Pickett And — which first made me think that some guy was ripping off Johnny Winters. That’s not the case. Charlie’s first band was called The Eggs. Later, after the original Eggs cracked up and Pickett moved to Minneapolis, his band became known as The MC3. Whatever he was calling his group, Pickett played a high-charged brand of roots rock. Like any self-respecting bar band of that period — or, I’d argue any period — his debt to Exile on Main St.-era Rolling Stones is proudly displayed. On the other end of the spectrum is the upbeat “Penny Instead,” in which Charlie sings about his unabashed love for a woman, happily comparing Penny to less desirable girls in his past (“I could have had crazy, but I got Penny instead”) while his slide guitar squeals with delight. One of my favorites here is “A. on Horseback” — the “A” is short for “America.” It’s a nostalgic look at this great nation of ours (“There were giants in those days”), featuring a cool ongoing duel between Pickett’s slide and Jim Duckworth’s burning guitar. Then there’s “Marlboro Country,” which shows The Eggs could handle the “Louie Louie”/“Hang On Sloopy” riff with the best of ’em. * Poison by Hundred Year Flood. Speaking of great American bar bands, Hundred Year Flood is one group whose members I hope never go to law school. Their long-awaited fifth album is ng short of a jewel — and a polished jewel at that. Poison is definitely slicker than most of the group’s previous releases. But it works. Several tunes stand out here. Some of them are ones the band has been playing live for some time now. The opening cut, “Hell or High Water,” has received much attention because Taj Mahal plays harmonica on it. Taj sounds great, but I’d be hooked on the tune even without him. It’s a slow swamp-stomper that starts off with Bill Palmer singing, “Last night I heard the coyotes howl and moan.” It’s like an omen that sets an uneasy mood. Felecia Ford sings the next verse. 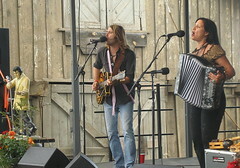 Flood’s repertoire is roughly divided between “Bill songs” and “Felecia songs,” but some of the band’s best are the ones on which they both sing lead. The title song is one of the catchiest rockers on the album. It features a “Peter Gunn” bass line and a garage-rock guitar riff that will poison your brain. The lyrics of “Sara & Jane” sound a little bit like an early Bruce Springsteen song, though the music, with a whining electric guitar, sounds a lot like classic Fleetwood Mac. “Neck of the Woods,” which features vocals by Flood pal Shannon McNally, is awfully purdy, but the most gorgeous song on this album (and perhaps in HYF history) is “Truly.” Sung by Ford, it’s nothing but a sweet declaration of love and fidelity (those of us who were at the band’s performance on the Plaza last summer, the day that bass player Kendra Palmer and drummer Jim Palmer had their baby, will always remember “Truly” as the song that opened that show). After a few listens, my surprise favorite on Poison is “Down Thru the Holler,” a minor-key folk-rocker with some fine acoustic guitar work by Bill Palmer and haunted harmonies between him and Ford. I’ve said it before. This town is lucky to have a band like Hundred Year Flood. This album reinforces that notion.